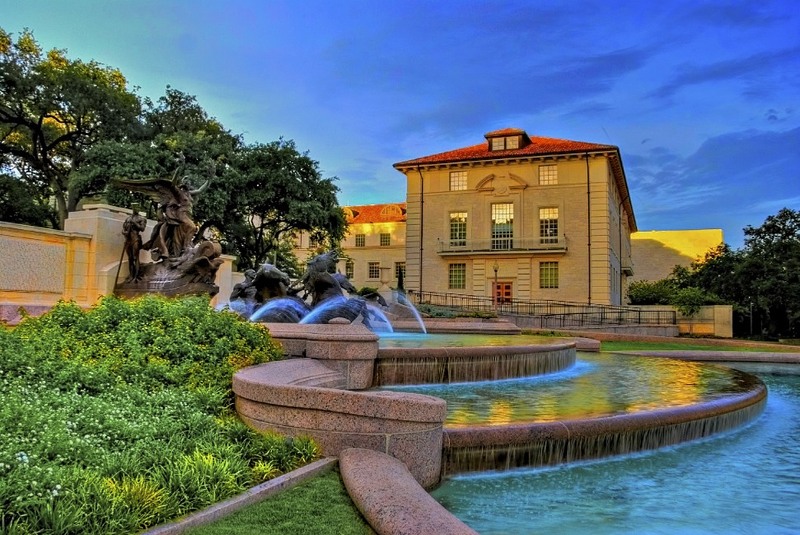 On a recent evening I was strolling around the University of Texas campus and took some shots of the Littlefield Fountain. In this case, after doing the requisite head-on shots, I headed over to the side because the sun was setting to my left and I liked the glow it left on Benedict Hall in the background. There is a nice open area behind this fountain called the South Mall, which leads up to our famous tower. The South Mall is bordered on each side by 3 red tile roofed buildings, commonly referred to as the Six Pack. I like the contrast of the blue sky with the red tile roof, I like the architecture of Benedict Hall, and of course I like the fountain. Everybody likes the fountain.